Plaque memorializing Francisco Lopez as the discoverer of gold in Placerita Canyon, March 9, 1842. 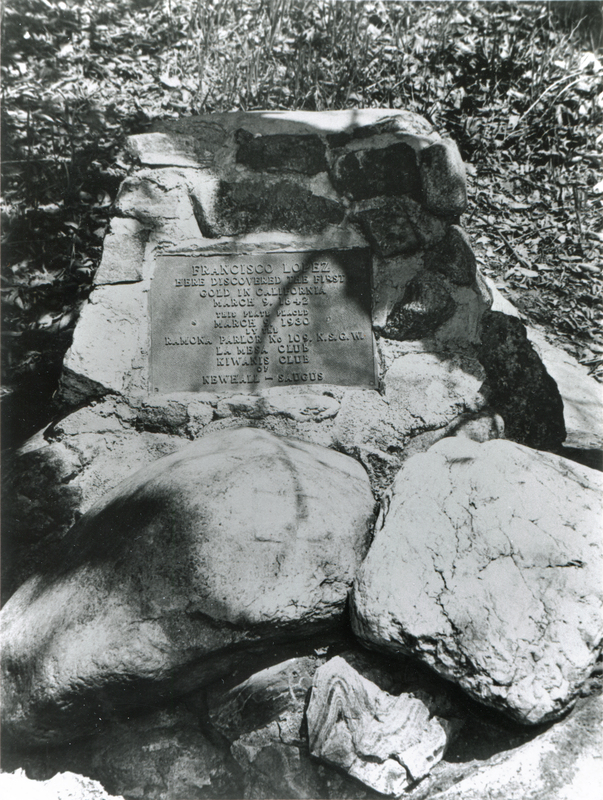 The plaque was placed 88 years later, March 9, 1930, amid some sycamore trees at discovery site. It was then stolen. The plaque, not the trees. In fact it was one of two plaques placed that day — this one, and another one that was bolted to the Oak of the Golden Dream, which first entered the public consciousness that day. Both plaques were stolen. This one was recovered. The other one wasn't. (See Perkins here, photo caption and fn. 37). This photograph would seem to predate the theft, considering that the plaque appears ready to be pried from the rock behind it, and hasn't yet been cemented in place. Note the Placerita fancy rock (Placerita formation) at bottom. AP1308: 19200 dpi jpeg from copy print.